In my many fortunate years of visiting Nevis, I’ve had some truly amazing experiences. From taking a boat out for a day’s fishing with a group of locals, to climbing Mount Nevis with a most knowledgeable guide called Dwayne, I’ve had more fun on this beautiful island than I would ever have imagined possible. However, one of my fondest memories is a day I spent with an American lady named Charlotte who, like me, had visited the Caribbean extensively and who had also been enlightened to the fact that this little island really is the jewel of the Caribbean. It was my third time on Nevis, and up until that point, I had always spent my time getting to know the locals as much as possible. If you are visiting Nevis soon or are thinking about it, I couldn’t recommend getting to know the locals more. Relationships with people who know the local area can be hugely beneficial, giving you insider knowledge and revealing hidden gems which mainstream tourist books haven’t discovered. While luxury resorts are lovely, they are inhabited by tourists and do not give an authentic experience of the true country itself. I would encourage you to sometimes venture outside of your accommodation; the true Nevis can be found when spending time with Nevisians. This is particularly easy as the island’s official language is English so you will always be understood by the locals. I had already built quite a rapport with some St Lucians, who on numerous occasions had taken me under their wing and given me an intimate insight into Nevisian life. So what is Nevisian life all about? Nevis is a sanctuary. Although it is popular with celebrities (notably in the past, Princess Diana and Helen Mirren) it doesn’t have any high-rise hotels or attract crowds who are interested in nightlife or all-inclusive beach resorts. The pace is slow: Nevisians don’t stress about schedules or being on time. The locals are kinder than in any country I have ever visited and are carefree; the product of their delightfully relaxed approach to living. Touristic highlights are not over-stuffed Louvres or A-list nightclubs, but the botanical gardens, or a hike up Nevis Peak – a 3,200 – foot volcano inactive since prehistoric times. Nevis is small and quiet and everyone knows everyone. With just a few times ‘liming’ (hanging out) with the locals, you will already begin to feel like a part of the community, and that is exactly what I recommend you do! One lovely experience I had with the locals was when I bumped into one of the fishermen I had met before and, in traditionally welcoming Nevisian style, he invited me for lunch and rum with his family. It may sound like a stereotype, but the people of Nevis really do love Caribbean rum! As it was only midday, however, I only had the one glass on this occasion but tucked eagerly into my meal of mahi-mahi, a fish that my new friend had caught just a few hours earlier. Our lunch break lasted just over three hours (not uncommon in ultra-relaxed Nevis!) and I couldn’t have felt more comfortable or at one with Nevisian culture. I felt touched as I thanked and bid farewell to the family. Such hospitality and generosity is a staple of Nevis but is rare in the wider world, so it still filled me with surprise and gratitude. After lunch, I headed to the beach and relaxed on the golden sands for a couple of hours. After a couple of blissful hours, I headed to Sunshine’s Bar on the beach for an afternoon cocktail, with a keenness to get to know more local people. It was on this walk that I met Charlotte. In the distance, I could see a woman walking precariously across the sands some way in front of me. My attention was suddenly drawn to her when I saw her take a step and then abruptly just sink into the golden sands. There was quite a scream of surprise and I hurried over to help the now thigh-deep lady to escape from her sandy predicament! She was very apologetic and embarrassed, profusely lamenting her choice to traverse the beach wearing 4-inch stilettos. I lifted her out of the hole her towering heels had dug for her, laughing the whole time. We discovered that one of her shoes had fallen off in the commotion, and I scrabbled in the sand like a dog digging a hole for a bone! I eventually came across the shoe and slipped it onto her foot. She chuckled but then decided it was safer to be barefoot this time as we walked to the bar. Before we even spoke, I got the impression that the woman was well-traveled. She was tanned and her hands were well-worn as if she had spent a great deal of time in the outdoors. She introduced herself in a charming New York accent as Charlotte. When we arrived at Sunshine’s Bar, Charlotte bought me a delicious cocktail (or three) to thank me for rescuing her and we commenced in the usual holidaymaker conversation; how long are you here for? Is it your first time on the island? etc. etc. I found out that Charlotte had visited Nevis frequently as she has a friend who had bought a property on Nevis. Charlotte knew a great deal about real estate on Nevis and, after the positive experience her friend had had, was keen to fill me in on the benefits. I learned that the property market in Nevis is robust and rapidly growing, with an upwards trend in prices and positive investment opportunities. 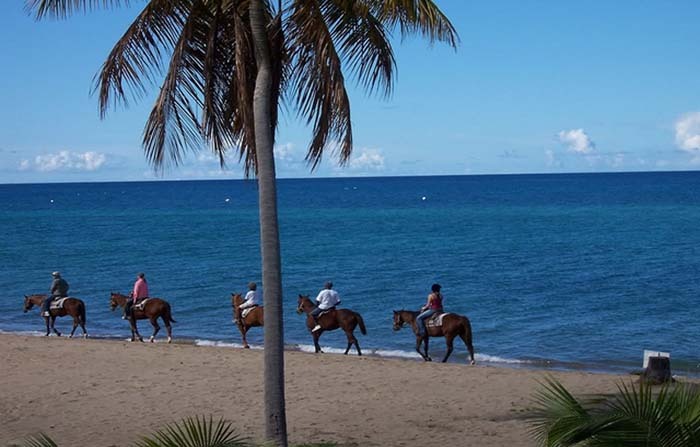 One of the most enticing reasons to buy in Nevis is that there are no income, wealth, inheritance, capital gains or gift taxes. Also, owning real estate can qualify you for economic citizenship if your investment is over US$400,000. Property in Nevis is well-established and organized and as a result, there is a diverse variety of properties to choose from, making you likely to find your perfect home or holiday home. Rental properties are in high demand and this can be tapped into to offset some of the costs of buying a property, including acquiring a mandatory Alien Landholding License and the cost of legal fees (around 2% of the purchase price of the property). Stamp duty is paid by the seller, not the buyer, unlike in many other countries. Above all, though, as a regular visitor to Nevis, I can see that the main benefit of buying property on Nevis is simply this: the opportunity to live in Nevis. Nevis is amongst one of the few remaining unspoilt Caribbean islands, its weather and scenery is fantastic and its population delightful. Charlotte and I chatted solidly for a few hours, most of our conversation centering on our love for the Nevis island and why it keeps bringing us back. We agreed that it was above all else the astounding natural beauty and the friendly locals. We arranged to meet up the next morning to explore the island together. We hired a car and drove in the glorious morning sunshine, starting out from Pinney’s beach and heading north up the island. I discovered that we had many interests in common, and we playfully conversed about our shared love of reggae and shellfish. Rather than break into song myself, I suggested we head to a local cafe to enjoy a late breakfast and listen to the ubiquitous sounds of the Caribbean. The cafe didn’t quite offer the shellfish we were after, but we enjoyed a fruit juice and a few songs before getting on our way. Charlotte can only be described as a free spirit, and her love for the sea and everything to do with it was boundless. We didn’t cover a huge amount of ground over the course of the day because every time we came across a beach (a common occurrence here on Nevis!) we would stop and explore it, taking some delightful photos. I think through the course of the day we ended up stopping at Paradise Beach, Newcastle Beach and Cades Bay and several others whose names I didn’t catch. Newcastle Beach was my resounding favorite as it was teeming with local fishermen, some of whom I recognized, laughing and comparing their catches. After this delightful interlude, we returned to the car and headed to Pinney’s for evening cocktails. We shared a lobster in the Lime Beach Bar and got chatting to some locals who said that the evening’s hotspot would be the Eclipse, a bar with a reputation for great music. As experienced Nevisian tourists, we knew that following the recommendations of locals was always wise. Following our new acquaintances to the bar, we soon found ourselves dancing the night away. By the small hours of the morning, we were both exhausted and I played the gentleman and escorted Charlotte home, where we shared a nightcap with the friend whose home she was staying at. It was the perfect end to a fantastic day. It turned out that Charlotte only had one more day on Nevis before her break came to an end, but I did see her on the beach later and we eagerly exchanged contact details. I still see her occasionally when our visits to the island coincide; we often spend a day together and we’ve grown to be close. I don’t just think of that day as a one off experience however, it’s characteristic of life on Nevis that one day, you can be chatting with someone at the bar, the next taking an adventure together. It’s just one of the reasons I love the island and am currently looking to buy a property on Nevis.